Author(s): Ebru K. Kocazorbaz, Ege University, Faculty of Science, Biochemistry Department, 35100 Bornova, Izmir, Turkey	Rabia N. Un, Adnan Erdag, Figen Zihnioglu. Background: Nine extracts from selected Bryophytes, A. californica, B. pomiformis B. stricta, C. conicum, F. antipyretica var. gracilis, G. lisae, L. sciuroides, M. polymorpha, T. barbuloides were investigated for their total phenolic content and glutathione S-transferase (GST) inhibitory activity. 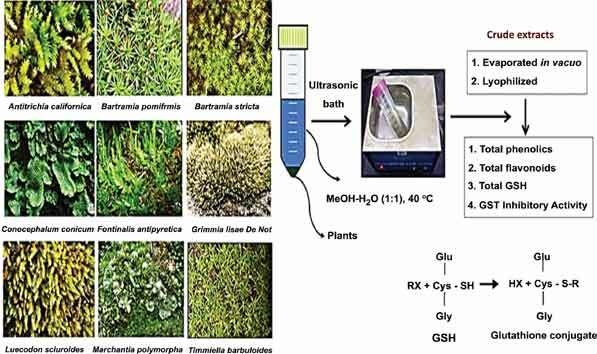 Methods: The flavonoid and phenolic content of nine extracts from Bryophytes were estimated by aluminium chloride and Folin-Ciocalteu method. The sheep liver fraction incubated with or without plant extracts and the activity GST was assayed using reduced glutathione (GSH) and 1-chloro-2,4-dinitrobenzene (CDNB) secondary substrate. Results: These results indicate the potential use of A. californica, C. conicum, G. lisae, M. polymorpha, and T. barbuloides can be regarded as promising candidates for natural plant sources of GST inhibitory effects. Conclusion: These plants can be examined in order to isolate and identify the active ingredients, and this may serve as a foundation to find safer and more effective agents for therapeutic use. Keywords: Biologic activity, bryophytes, glutathione-S -Transferase (GST) inhibition. Keywords:Biologic activity, bryophytes, glutathione-S -Transferase (GST) inhibition. Abstract:Background: Nine extracts from selected Bryophytes, A. californica, B. pomiformis B. stricta, C. conicum, F. antipyretica var. gracilis, G. lisae, L. sciuroides, M. polymorpha, T. barbuloides were investigated for their total phenolic content and glutathione S-transferase (GST) inhibitory activity.